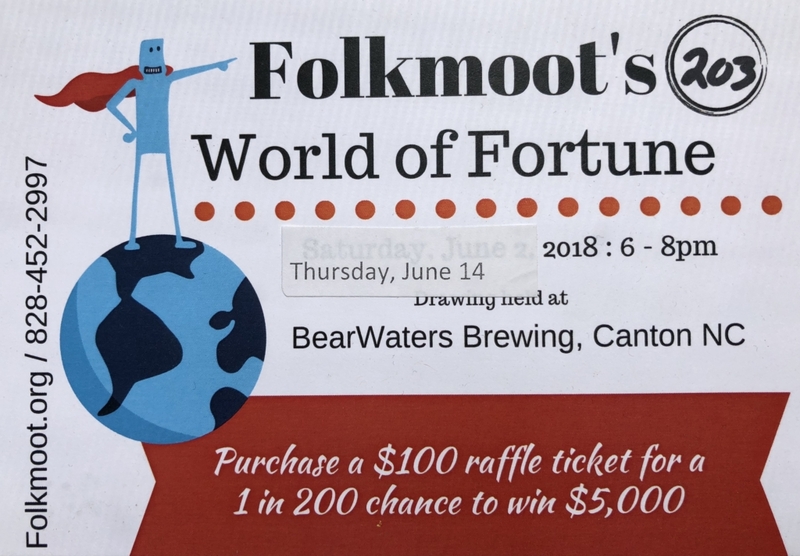 Trivia Night at BearWaters Brewery will feature Folkmoot’s World of Fortune event AND the release of Mountain Mojo Mango Lager, Thursday, June 14, 2018 from 7:00pm to 8:00pm at BearWaters Brewery in Canton. Teams of 4-6 people will compete brain to brain for an epic battle to win $500 and intellectual glory in the realm of world culture. Folkmoot experts have planned four rounds of twenty questions on topics like world history, global politics, current affairs, international movies, languages, arts & culture, geography, food, wine, beer and war & peace. Register for the World of Fortune at Folkmoot.org/Trivia. Each player must pay $20 to enter. If you purchase a $100 raffle you will receive free entree into the trivia game. The most exciting portion of the evening will be a drawing for $5,000! Between now and June 14 Folkmoot representatives are selling 200 tickets for $100 each to enter the drawing. The $100 entry fee can be shared between family and friends, neighbors, clubs and associations. Please visit Folkmoot.org/Trivia or call Folkmoot, 828-452-2997. BearWaters Brewery will also be hosting an After Party during the 2018 Folkmoot Festival on July 24. 2018 at 9:00pm. The 2018 festival dates are July 19 – 29 and feature cultural ambassadors/dance performing groups from Ghana, Italy, Czech Republic, Mexico, Venezuela and Northern Cyprus, Thailand and local Appalachian and Cherokee dancers and musicians. Get your tickets today by visiting Folkmoot.org or call, 828-452-2997. Tickets are still available up until the drawing at 7. Tickets can be purchased until 5:00pm by calling 828-452-2997. After 5:00pm, tickets are available for pick up at BearWaters Brewing in Canton.